How Hansel and Gretel, Sherlock Holmes, the movie Groundhog Day, Harry Potter, and other familiar stories illustrate the concepts of computing. Picture a computer scientist, staring at a screen and clicking away frantically on a keyboard, hacking into a system, or perhaps developing an app. Now delete that picture. 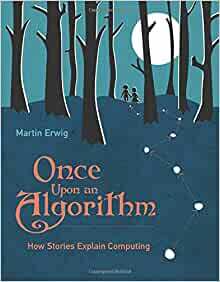 In Once Upon an Algorithm, Martin Erwig explains computation as something that takes place beyond electronic computers, and computer science as the study of systematic problem solving. Erwig points out that many daily activities involve problem solving. Getting up in the morning, for example: You get up, take a shower, get dressed, eat breakfast. This simple daily routine solves a recurring problem through a series of well-defined steps. In computer science, such a routine is called an algorithm. Erwig illustrates a series of concepts in computing with examples from daily life and familiar stories. Hansel and Gretel, for example, execute an algorithm to get home from the forest. The movie Groundhog Day illustrates the problem of unsolvability; Sherlock Holmes manipulates data structures when solving a crime; the magic in Harry Potter's world is understood through types and abstraction; and Indiana Jones demonstrates the complexity of searching. Along the way, Erwig also discusses representations and different ways to organize data; “intractable” problems; language, syntax, and ambiguity; control structures, loops, and the halting problem; different forms of recursion; and rules for finding errors in algorithms. This engaging book explains computation accessibly and shows its relevance to daily life. Something to think about next time we execute the algorithm of getting up in the morning. ...a thoughtful and approachable guide to the fundamentals of how computer science exists as an intellectual discipline. This is a wonderful book. Algorithms and computation explained using the likes of Hansel and Gretel, Indiana Jones, Sherlock Holmes, and Harry Potter. For 35 years I've been trying to explain to people that algorithms are all around us, and that algorithmic thinking is an absolutely crucial skill that is needed in our day-to-day lives way beyond mere computers and electronics. Finally, here is a book for them to read. 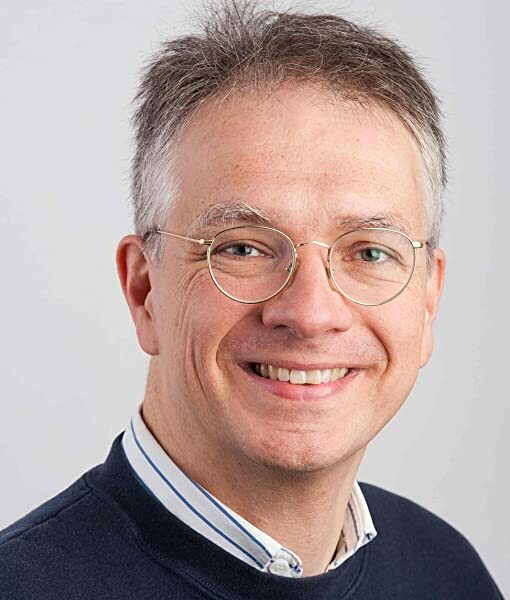 By connecting computing concepts with popular stories, Martin Erwig helps both the general public and students see computing's relevance beyond traditional technology contexts. I suspect that readers will begin to see computing everywhere! Clever algorithms and data structures are at the core of computer science. This book is an excellent exposition of computational and informational thinking, and one that is unusually accessible to anyone with an inquiring mind. 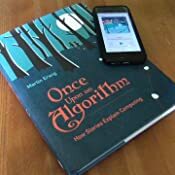 Start reading Once Upon an Algorithm on your Kindle in under a minute. 4.0 out of 5 starsComputer Science student enjoyed this book but parts of it were inconsistent and confusing. I've been trying to learn computer programming recently and realized that I needed a good understanding of the computer science fundamentals. So I was drawn to buy this book because I appreciate good storytelling. Furthermore, the fundamentals of computer science explained in story form??? Sign me up! I was pretty impressed by the content and would recommend it to anyone who is trying to learn the basics of computer science. My only complain about this book is that some chapters were poorly explained compared to other chapters. So there is a lack of consistency throughout the book. It was a good read for the first couple of chapters but the remaining was just too difficult to comprehend even after spending many hours/days on it! Needless to say, I am completely aware that computer science is a subject that takes times to fully grasp its concepts but some chapters in the book could use simpler terms and explanations for a college student like myself. A book that would bring together computer science with popular literature and movies was a must buy for me; I now own both the book and audiobook! However, the chapters in this are like Hollywood releases: occasional hits, most quickly forgotten, and several flops. Professor Erwig is a master of his field, like the talented chefs in the shows. He is provided the unorthodox ingredients of fairy tales and popular movies to compose a textbook on computing. Most of the creative dishes he concocts are a testament to his own ability, but not necessarily something that should be in a cookbook in everyone’s kitchen. There is a pleasant progression of tastes through the book, from various CS appetizers to the dessert of ‘Abstraction’. The skill demonstrated in each chapter is sometimes in how well Dr. Erwig flavors the CS concept by using the cultural references, and other times it is how he has to transform the story to work with the topic. For example: “Sherlock Holmes manipulates data structures when solving a crime” is a discussion of Holmes organizing a list of suspects not about his famous deductions. The chewiness of each chapter varies in conjunction. Those who will most appreciate what Dr. Erwig has crafted will already be in possession of a refined palate. Those looking to refine their palate will find some benefit from this experience, but will need to continue sampling other offerings. Computer Science’s growing influence on everyday life is motivating the integration of CS into K12 schools. However, that leaves out the other 76% of the population who are no longer students! We need more books/movies/songs/shows/etc attempting to introduce these concepts in new relatable and approachable ways. Algorithms to Live By & Computational Fairy Tales are similar books that are worth checking out. I liked it but only as a supplementary source. 4.0 out of 5 starsIt's a fun way to break down hard concepts! Pros: This book is great for someone who is learning new concepts in computer science and data architecture. Cons: It can be dry at times. The infographics provided in the book are very basic. I'm new to learning about computer science and this books is great in breaking down what an algorithm is and how it works. The language of the book is precise and clear, which was really helpful in defining the parts of the algorithm. If i read this book earlier, i believe i face less problem doing my phd. Highly recommended not only for non ITs but also to those doing CS. 5.0 out of 5 starsWhat is computer science? Computer science is a poorly understood field, and Martin Erwig has set out to give people an accessible but rigorous avenue to learning what computation is and why it's interesting in the real world as a way of solving general problems, as opposed to something that happens magically in your laptop or phone. This book isn't about personal computers or computer software, instead it's about how we all compute solutions to small problems in our daily lives without even realizing it and how the field of computer science formalizes those processes. He uses widely known stories and characters (Hansel and Gretel, Harry Potter, Back to the Future, Indiana Jones, etc.) as examples to help guide the material, which keeps the book from being too dry even when getting into the nitty gritty. Not all of this book is easy reading, but if you have a genuine interest in learning more about computer science and problem solving then I don't know of a better way short of spending four years (and a lot of money) at a university.